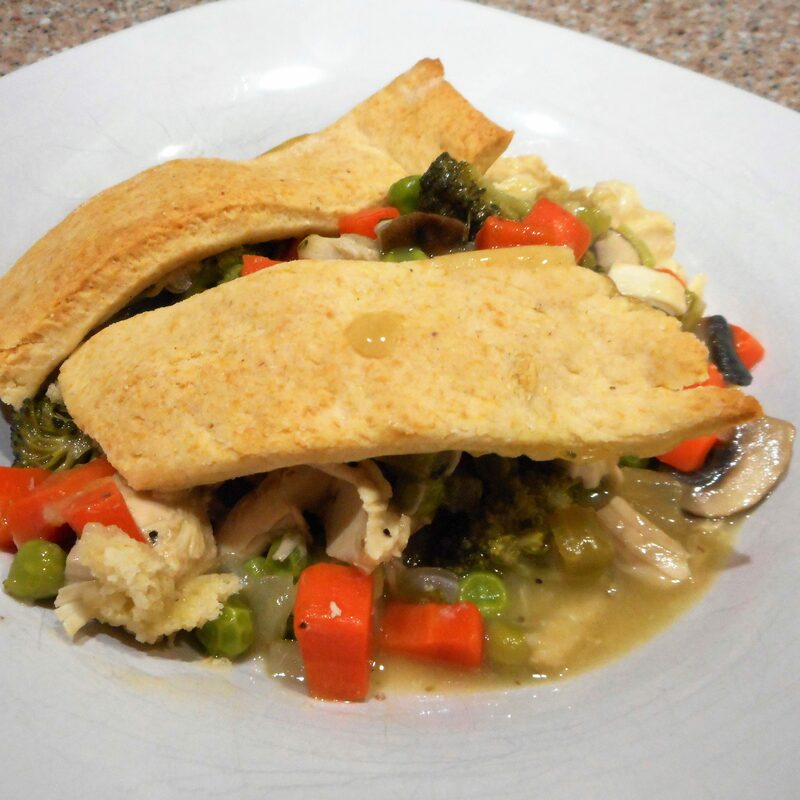 If the crust is your favorite part of a pot pie, you’ll love this recipe. A little cornmeal in the crust keeps it from getting soggy. 1. Preheat the oven to 450°. Lightly grease a 9″ square baking dish. 3. In a large glass measuring cup or microwave safe bowl covered with plastic wrap, stream the broccoli with 1 Tbsp water for 1 minute. Immediately drain the broccoli in a wire strainer and rinse with cold water to stop the cooking. Set aside. 4. In the same container, steam the mushrooms for 1 1/2 minutes, but do not drain. Set aside. 5. In a large saucepan or deep skillet, melt together the butter and oil. Add the onion, celery, carrot, and poblano. Stirring often, cook the veggies until they just begin to soften. Season with the salt and pepper, then stir in the flour. Cook for 2 minutes, stirring almost constantly. Slowly stir in the chicken broth and cook, stirring constantly, until the filling is hot and bubbly. Stir in the chicken, peas and mushrooms, turn off the heat, and cover to keep warm. 7. In a food processor or medium bowl, combine the cornmeal, flour, salt and baking powder. Cut in the butter until small crumbles start to form but baby pea sized pieces of butter remain. Blend in the cold chicken broth, then slowly drizzle in the cream or milk, adding just until a soft dough starts to form and pull away from the sides of the bowl. Place the dough on a lightly floured surface and pat it into a square. Roll the dough to 1/4 inch thickness. Cut the dough into 2-inch-wide strips. 9. Stir the broccoli into the filling at the last minute. 10. Pour 1 1/2 cups of the filling into the bottom of the buttered dish. Closely line half of the dough strips on top of the filling. Bake for 12 to 16 minutes or until the dough starts to brown. Remove from the oven and pour the remaining filling mixture over the baked strips. Closely line the remaining dough strips on top. Bake for another 12 to 16 minutes or until the dough has browned.